free online video coverage of papal events. events as they happen in Washington, New York City, and Philadelphia. 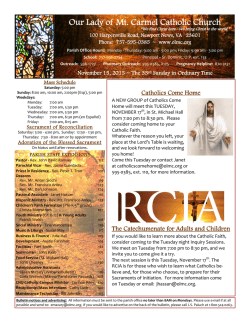 www.USACatholic.Church on your smartphone or tablet. Gathering Room. The next meeting is September 30th. prayer experience with other women. and cannot do, and how to find peace as we give the responsibility to God. already registered and are interested in the bus. during the break-out session of Gathered By Grace. 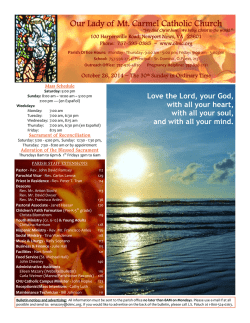 All middle school-aged members of the parish are invited to attend! a year of faith, fun, and fellowship! include the names and ages of your children when you RSVP. complete their Sacraments of Initiation. Do you have a child in 2nd - 5th Grade? get registered, and to receive the schedules and materials for preparation. Call ext. 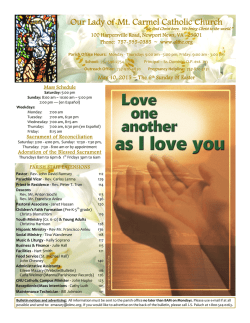 107 or e-mail cblomstrom@olmc.org. 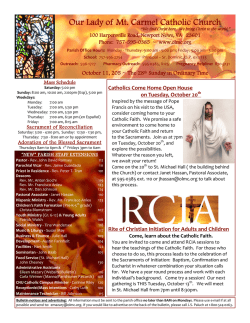 Sessions begin October 11, so call today! 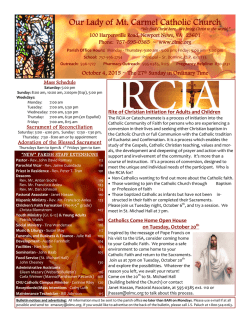 Come Home to your Catholic Faith! updating. Come back to the Lord’s table! 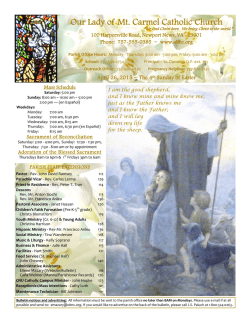 Children’s Ministry: Registration has Begun! Do you have a child in PreK - 5th grade? Children’s Faith Formation is part of our Gathered By Grace Program. 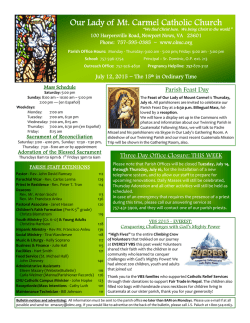 For up-to-date information, visit us at olmckids.weebly.com or contact Christa at cblomstrom@olmc.org. 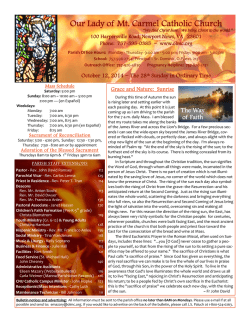 Thank You to everyone who signed up last weekend to become involved in the music and liturgical ministries at OLMC. especially in need of male voices. all in need of new members. 595-0385, ext. 117 to sign up or to ask any questions. Virginia and is a self-advocate at the international level. inspiring story of determination and hope! You assisted 30 women and 33 children this month. Laughter begins at 7pm, followed by dessert! Sign up at soulsisters@olmc.org or call Helen: 898-7851.
some fun with the Spanish language! boring "let's conjugate some verbs"
or on vacation. All adults and young adults are welcome! St. Vincent's clothing closet. Thank you!! seen by everyone receiving the emails. the penalty line and must be accompanied by a parent or guardian to register. is Harold Hairston at 870-1192. Boardwalk - Sunday, October 11.
in memory of Rob Weimer. the Church. Your gift helps provide prescription medications, nursing care, and more. Please be generous. faculty, OLMC parishioners, and the parish itself toward the complete conversion of a workspace in to the chapel. décor. Seating is the final element to be completed, but the chapel is now in use with temporary seating. very pleased to be sharing the chapel for Daily Mass during the parish renovations. diócesis ha devuelto a las parroquias cerca de $4.4 millones. nuevas iniciativas para continuar con nuestra misión de encontrar a Jesucristo en OLMC y llevarlo al mundo. Si usted desea podrá hacer su donación en 10 cuotas mensuales, lo cual hace que con facilidad apoyemos a los ministerios de nuestra iglesia diocesana, mientras cubrimos las necesidades de nuestras parroquias. Agradecemos de antemano su generosa colaboración en esta Colecta 2015. Primera Comunión y/o la Confirmación. Orientación sobre el programa e inscripciones. suéteres, bufandas y guantes para el fin de semana de octubre tercero y cuarto en la iglesia! estará disponible y los artículos serán entregados a LINK y la ropa al armario de San Vicente.